Of course, that meant that we had to, er, cook for everyone. As if there wasn’t enough resting on the evening. We’d actually only been vegetarian for a few months, and it was clear that everyone thought it was a phase. So much so, in fact, that I suspect that everyone arrived that night expecting meat. 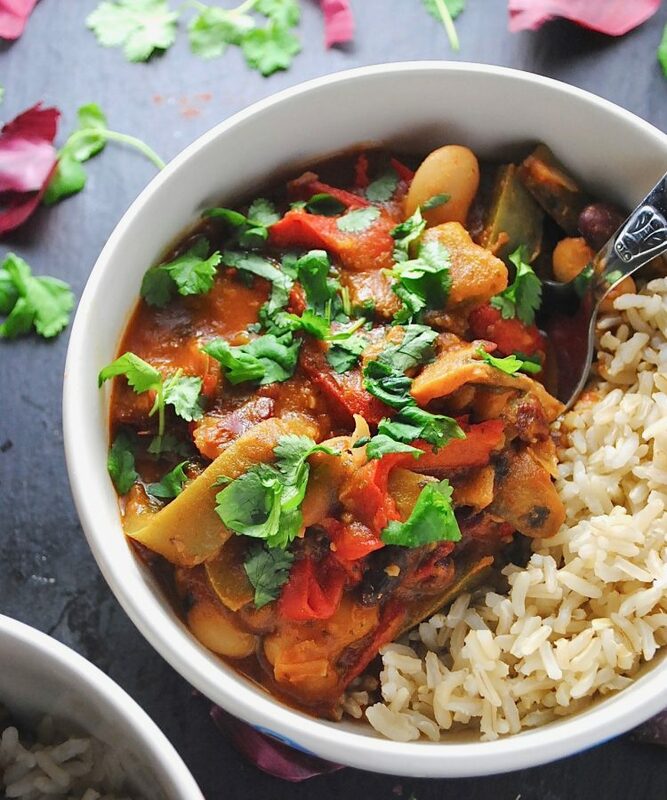 Instead, we served this One Pot Vegetarian Chilli. “Actually.” Yep, who knew that vegetarian food could actually taste good?! We learn something new every day. Especially considering that the older generation tend not to be so generous with their enthusiasm, I counted this as a win. I think you can see what I’m trying to say here. 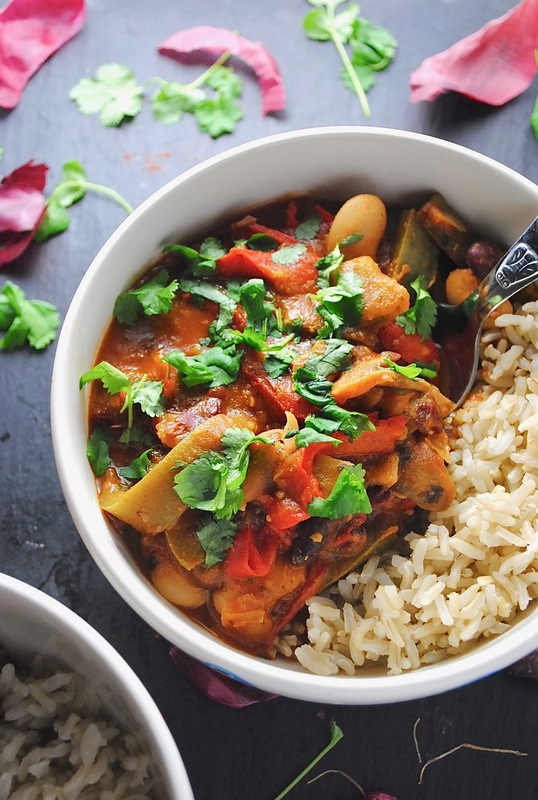 This Easy One Pot Vegetarian Chilli was a hit with two grumpy old men who think that a meal isn’t complete without meat. If that isn’t praise for this recipe, I don’t know what is. Now before we get onto how you can make this beautiful thang, let me mention a few EXTRA (!!) bonus points regarding this One Pot Vegetarian Chilli. Packed with ALL FIVE of your 5-a-day! Looking for even more ways to boost your 5-a-day? 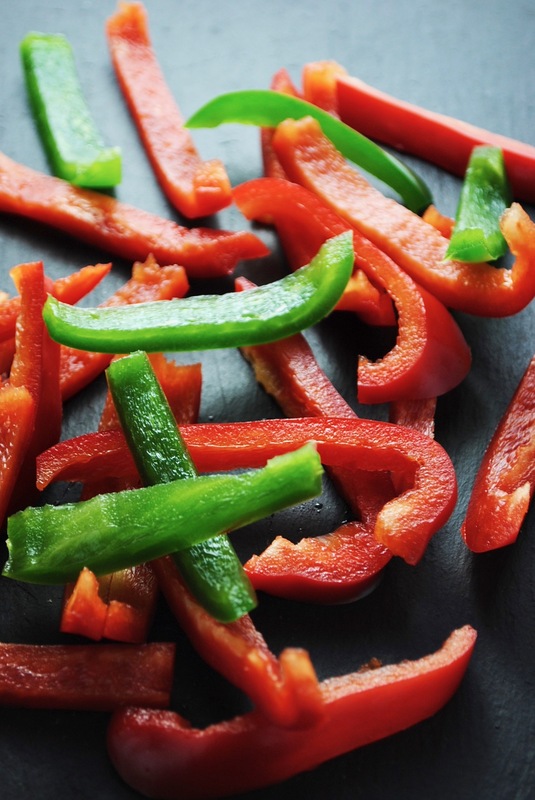 Check out this post on 9 Easy Ways to Eat More Vegetables. Now that you know the facts, let’s talk about how you can make it. It couldn’t be easier. Seriously, you CANNOT MESS THIS UP. Simply heat some oil in a large pan, throw in all of your vegetables and fry until softened, add the remaining ingredients, and simmer for 20-25 minutes. That’s it. You’re done! Dinner on the table in 45 minutes, and lunch for the next day, too. Smart cooking for the win. 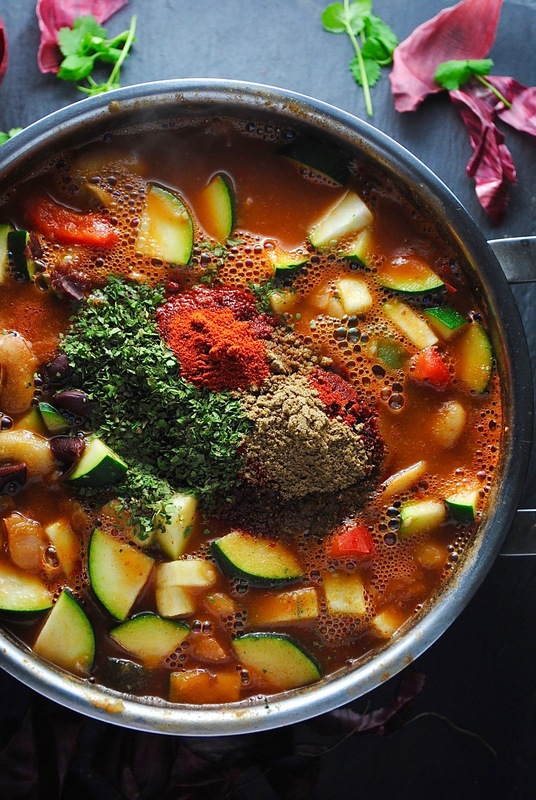 This One Pot Vegetarian Chili is warming, cheap, healthy and so easy that it would be impossible to mess up. It's also great for lunch the next day! Heat your chosen oil in a large pan. Add in the bell peppers, mushrooms, courgette, red onion and garlic and fry together on a high heat for about 8 minutes, or until softened. Next, pour over the tomato passata, vegetable stock, herbs and spices. Stir together to combine, turn down the heat to medium-high, and then add in the kdiney beans and butter beans. Simmer for 15-20 minutes, or until the sauce has thickened. You can also turn down the heat to a very low setting and simmer for longer for an optimal infusion of flavours - or if you're not ready to eat right away. (Optional) Serve with a sprinkling of fresh coriander. You can also serve with a grain or pseudo-grain, which will take the portion further. This One Pot Vegetarian Chili yields 4 servings if eating on it's own, and 6 servings if accompanying with a grain or pseudo-grain. Great recipe Molly. It sounds like a big party of amazing flavours. The only thing that confused me is that you don’t mention adding water to the pot, although in the photos it looks like you did. I would think that at least some water has to be added in the pan after the vegetables have softened. Maybe I am wrong. Yeah it does now. I was just confused for not seeing the word “water” anywhere. Thank you for the clarification. 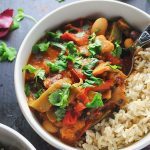 I love the combination of beans and veggies that you used in this chilli, it sounds amazing in everyway, superb recipe, and yeah if you can get carnivores to love it, you got a BIG winner here! Haha, thanks Albert! I don’t believe I’ve combined butter beans and kidney beans in any recipe other than this, but their similar textures work really well together. If you make it, hope you love it too! That’s great to hear, Maria 🙂 adding more plant based meals into your repertoire is always a good thing – ethically, but also to add more variety to your diet! 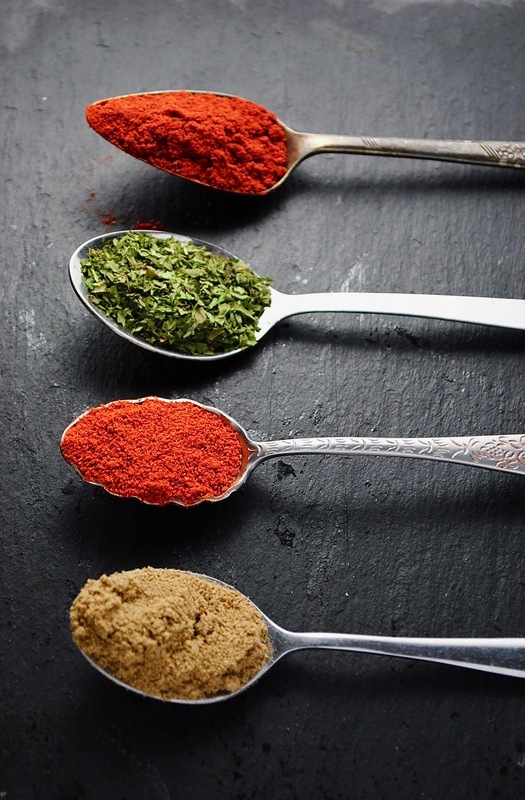 Our gut bacteria love variety, not to mention fibre (of which there is lots in this recipe! ).